The Population sizes of arctic-breeding geese have increased dramatically during last decades. A warmer climate is expected to provide increasing availability of nesting sites and food, making the geese “climate winners”. Geese are migratory herbivores, with a central role in many tundra foodwebs, including Svalbard. 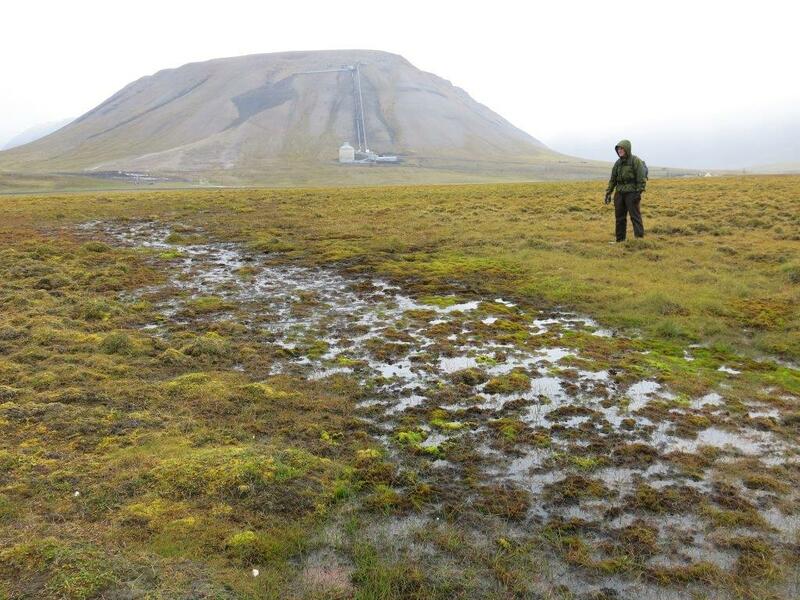 Increasing goose numbers on Svalbard lead to a stronger pressure on the tundra vegetation. In combination with reduced snow cover, exposing the tundra to grazing for longer periods, the vegetation in Svalbard may be damaged although an extended snow cover may also protect the tundra. The impacts of geese on vegetation are addressed in collaboration with the moss tundra module. Geese, especially eggs and goslings, are an important prey for the arctic foxes and avian predators. The importance of geese in the low arctic foodweb of Varanger is limited, as only small local breeding populations exist there. The Pink-footed Goose (Anser brachyrhynchus), and the Barnacle Goose (Branta leucopsis) are target species in the COAT Goose Module. The populations have increased significantly in numbers over the last decades. Most of the geese breed on the western part of Svalbard (Goosemap) but are currently expanding their distribution. The red-listed Brent Goose (Branta bernicla hrota) is also present on Svalbard, although the COAT goose module does not address its dynamics. Population size of the Svalbard-breeding Pink-footed Goose, 1965-2016. Estimates are based on coordinated counts along the flyway (Belgium, Netherlands, Denmark and Norway) in May and November. Geese are often referred to as “climate winners” as a greener winter and spring have provided the geese with more and easily assessable food. The main climate effect is expected to act through earlier snowmelt at their breeding grounds. It affects geese directly and indirectly, via increased availability of snow-free nest sites and food abundance. Earlier snowmelt will thus give room for more pairs with successful reproduction within the narrow time window for breeding in the Arctic. Earlier breakup of the sea ice will exclude foxes from the islands where geese nest, further improving their breeding conditions. 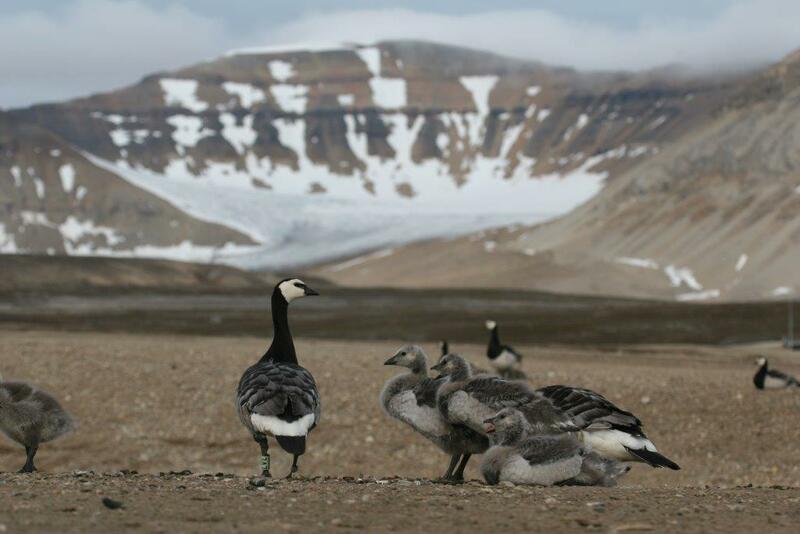 A warmer climate and more geese may collectively expand their distribution in Svalbard, both north- and eastwards. Yet, warmer springs can also affect geese negatively. Earlier snowmelt results in an earlier start of plant growth. As the nutritional quality of plants is highest in spring, such shift can lead to earlier availability of high quality food. If the geese cannot adjust the timing of egg laying, this can result as a mismatch of food availability and the goslings nutritional needs. Expected effects of climate and management on Svalbard geese. The impact of earlier springs, both directly and indirectly, are expected to be the two strongest climate pathways. We also expect management of geese to be an important determinant of goose abundance. An additional climate change pathway works through predation pressure by the arctic fox. Climate affects arctic fox abundance both directly and indirectly via availability of reindeer prey. The pink-footed geese increasingly utilise farmland at temperate wintering and stopover sites. Hence, crop damages are source to many conflicts with the agricultural interest. 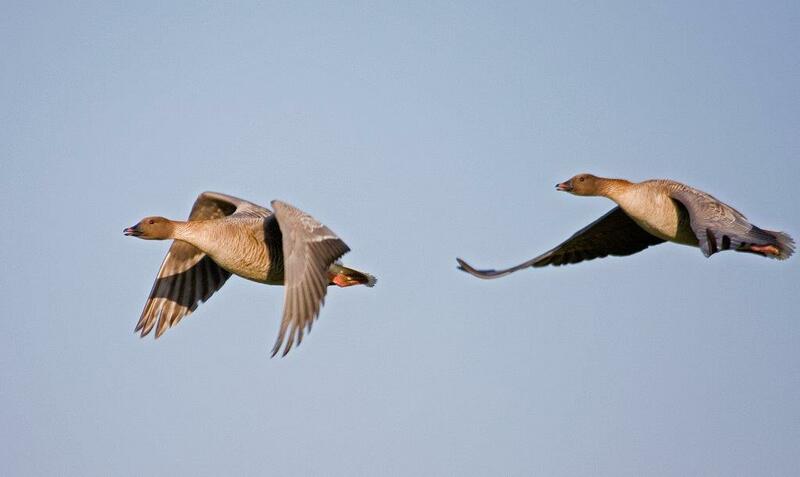 In an international management plan for Pink-footed Goose, one of the actions is to reduce the numbers in order to reduce conflicts with agriculture in temperate regions and reduce negative impacts on the Svalbard tundra vegetation. Autumn hunting is therefore an important management tool for this species. Pink-footed goose is also the only goose species hunted on Svalbard, but the harvest is limited. The Barnacle Goose is a protected species and other management tools are needed. In Svalbard, they presumably have less impact on the tundra than the Pink-footed Geese, and they also suffer from a higher egg-predation rate from polar bears. In the breeding season, some periods are specifically vulnerable, and it is of vital importance to maintain the protection of the nesting colonies. Moreover, families with young in the moulting period, when geese are flightless, are vulnerable in relation to tourist activities and other human traffic. 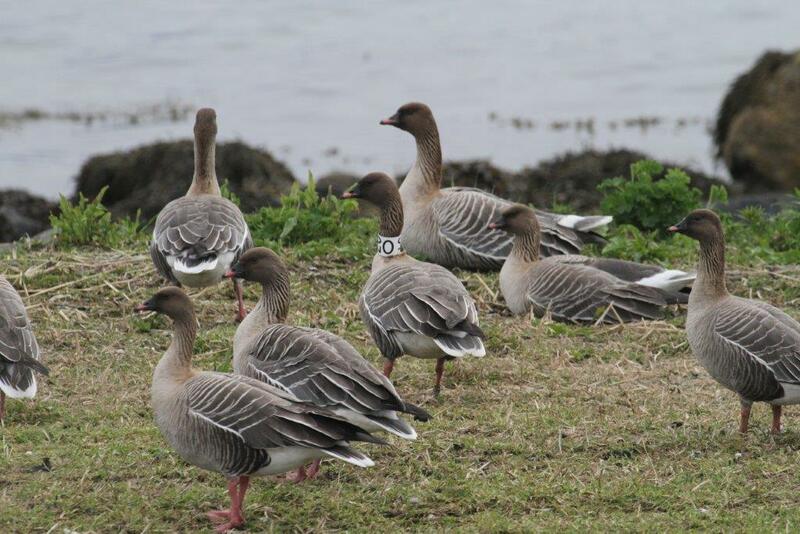 Goose population status and trends: The Pink-footed Goose and the Barnacle Goose are monitored internationally with coordinated counts along their flyway in the non-breeding season. Breeding pair density, timing of settling and reproductive success are monitored with colony surveys. The use of automatic cameras for these state variables is under development. Automatic cameras will also give information about predation events and rates. Monitoring of forage plant availability and phenology is under development in collaboration with moss tundra module. Goose impacts on vegetation are monitored with repeat surveys of vegetation cover and bare ground. Anderson, H.B., Speed, J.D.M., Madsen, J., Pedersen. Å.,Ø., Tombre, I. M., van der Wal, R.
Late snow melt moderates herbivore disturbance of the Arctic tundra. Hessen, D. O., Tombre, I. M., van Geest, G. & Alfsnes, K.
Global change and ecosystem connectivity; How geese link fields of central Europe to eutrophication of Arctic freshwaters. Madsen, J., Williams, J. H., Johnson, F. A., Tombre, I. M., Dereliev, S. & Kuijken, E.
Implementation of the first adaptive management plan for a European migratory waterbird population: The case of the Svalbard pink-footed goose Anser brachyrhynchus. Tombre, I.M., Erikstad, K.E. & Bunes, V.
State-dependent incubation behavior in the high arctic barnacle geese. 2012. Polar Biology 35: 985-992. Jensen, R.A., Madsen, J. O’Connell, M., Wisz, M., Tømmervik, H. & Mehlum, F.
Prediction of the distribution of Arctic-nesting pink-footed geese under a warmer climate scenario. 2007. Global Change Biology 14: 1-10.